Got a special occasion coming up? Celebrate with stunning flowers created by the talented team at Stems Floral Design in Rotherham. This South Yorkshire favourite offers a fresh, vibrant selection of colourful flowers for all occasions. Whether you’re looking for that perfect birthday gift or you want to spring a romantic surprise, Stems Floral Design are delighted to help. Manager Vivienne Tanguy and her highly qualified florists can offer expert advice and create custom designs just for you. Visit the florist’s Facebook page to see examples of the team’s latest work, as well as glowing reviews from delighted customers. 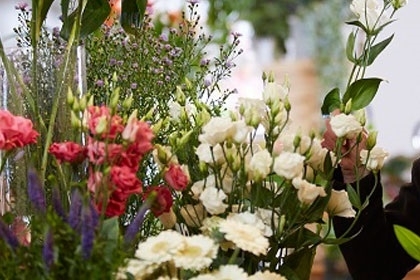 If you’re tying the knot, trust this much-loved local business with your wedding flowers. Everything from your bridal bouquet to the flower girl’s blooms will be picture perfect and handled with skill and care by the Stems Floral Design team. The florists can also offer guidance to help you make the right choices when you’re looking for funeral and sympathy flowers. Whether you want a design from the florist’s considerable range or you’d prefer a custom-made display to commemorate your loved one, they will go out of their way to help you. To find this florist, head for the centre of Rotherham and look for a charming shop with a traditional awning and stunning displays outside. Stems Floral Design is not far from local attractions including Clifton Park Museum, Boston Park and Keppel’s Column.